With the H2 Pro 055 Twist Lock bezel system, it makes for an ideal solution for 1st & 2nd fixing as the downlighter can be installed and the bezel can be put in place after the decorating is finished. 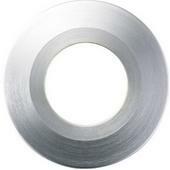 This Brushed Steel bezel is for use with the DL35638NW/WW and DL35660NW/WW Down-lighters. The Bezel is metal coated plastic. Please note that this listing is just for the Brushed Steel bezel Only, you will need to purchase a separate down-lighter.